The Agape Christian Saints (1-3) of Orlando defeated the Maclay Marauders (0-5) 36-7 at Maclay last night. With only a 15 man roster, the Saints were able to pull a significant win over the Marauders. The Saints scored 18 within five minutes of the first quarter. In the third quarter, Saints’ senior quarterback, Cameron Stroud, scored a touchdown after intercepting a pass from Maclay’s Jack Brady and running it 75 yards down the field. Bernard Poitier, a senior fullback, also scored a touchdown for the Saints after an interception that led to a 46 yard run. Jack Brady, the freshman quarterback for Maclay, struggled against the Saints last night. Brady threw 19 incomplete passes by the end of the fourth quarter. AJ Miller, an eighth grade running back, set the Marauders up on the three yard line for a touchdown after a 29 yard run. The Marauders were pushed back and the ball was eventually intercepted by Poitier of Agape. “We need to figure out what we are missing. We make mistakes that we could easily avoid,” said senior linebacker Phillip Billings. The Marauders were missing senior running back and linebacker Scott Ereckson, who has had the most tackles for the Marauders this season. 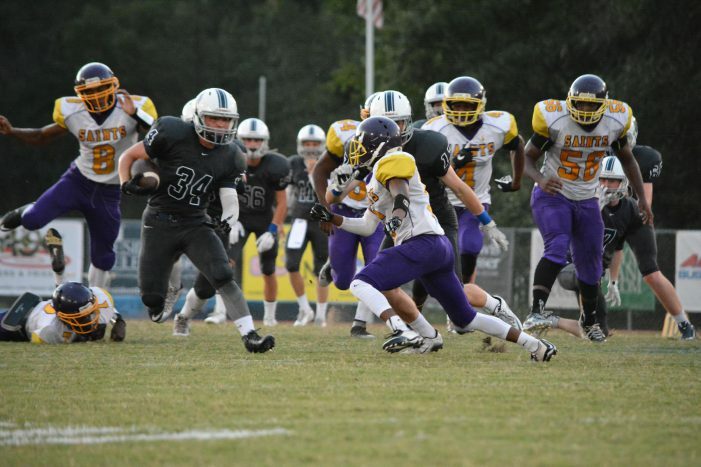 The Marauders continue their effort for a win against FAMU High School on Oct. 2 at Maclay.